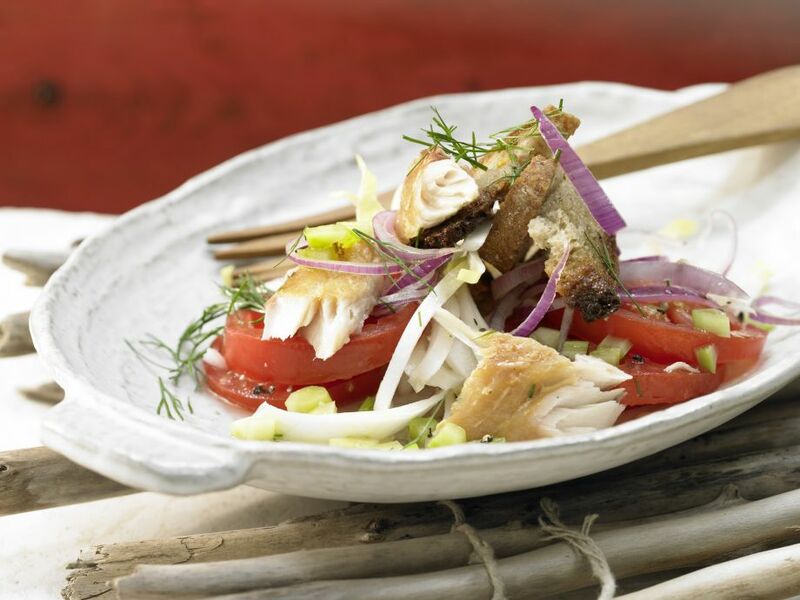 Juicy smoked fish and crispy croutons — a great combination! 1 Toast the bread under the broiler (or in a dry pan) until crispy on both sides. Peel the garlic, halve and rub over toast slices. Tear or cut bread into small pieces. 2 Rinse celery, pat dry and remove any strings. Finely chop celery. Rinse tomatoes, cut out the stems and cut into slices. 3 Peel onion and cut into very thin rings. Mix onion with tomatoes and celery in a bowl. Drizzle with olive oil and vinegar, season with salt and pepper and toss to combine. 4 Rinse endive, shake dry and cut into very thin strips. Rinse dill, shake dry, pluck fronds and coarsely chop. 5 Remove skin from mackerel, if necessary, and tear fillets into small pieces. Add endive, dill and mackerel to bread mixture and toss to combine. Serve immediately.